Just when it appeared the contentious bankruptcy deal involving the future of Willow Creek Golf Course was done, a new dispute threatens to upend the agreement again. A vote last night by commissioners to participate in the settlement was too late to record for this story. But during a break in Tuesday’s meeting, District Attorney Brian Kunzi was asked if everything was going smoothly after parties in the Chapter 11 bankruptcy case of Caldera P&G seemed to reach a last-minute settlement after a hearing in Las Vegas on Aug. 7. Commissioners were to vote to ratify that new agreement — the county would take possession of six easements at the golf course and let a dispute over water rights drop for now — and then the parties were scheduled to go before a judge again today for a final time and a final resolution. Now, it looks as though the judge will have a whole new mess to sort out — federal Judge Linda B. Riegle blasted Utilities Inc. of Central Nevada’s attorney, Kunzi and the bankruptcy trustee’s lawyer during the last hearing for failure to come to an agreement after embarking on negotiation, as far back as March. So it is anyone’s guess how she’ll react to this new wrinkle. Robert Atkinson, attorney for the bankruptcy trustee, Joseph Atkins, laid out the dispute for the court in a filing yesterday. He wrote that the issue of water rights remains unresolved and that one key term — “open space” — has brought the parties to loggerheads this time. “The permanent easement is essentially a contract between UICN and Nye County and it has since become apparent that there is no ‘meeting of the minds’ between UICN and Nye County relating to the relative rights of the parties in the future (such as relating to water rights), and the definition of certain key terms (such as ‘open space’). The Trustee believes that Nye County and UICN are both steadfastly maintaining their diametrically opposite positions on these issues in good faith, albeit with some miscommunication and perhaps unnecessarily inflammatory rhetoric. No amount of settlement conferencing will be able to bring these parties together on such polar opposite fundamental beliefs,” the filing states. An Aug. 12 letter sent to Kunzi by UICN attorney Laura Granier appears to attempt to settle whatever leftover issues remained between the utility and the county. Among those was the use of water rights and the definition of “open uses,” a phrase Kunzi used during an emergency settlement conference ordered by Riegle on Aug. 7. The letter clearly spells out UICN’s concern that the county is also angling to part the for-profit entity from its chief asset — water. The county’s response to the letter was not made available to the PVT. The letter continues to acknowledge that the source of disagreement may lead to future court battles, but also states that it shouldn’t prevent the tentative agreement from going forward. Atkinson called the easement dispute a “rabbit hole” of never-ending disagreements in his Tuesday filing. “The Trustee further believes, and, indeed, has become utterly convinced, that this easement, which on its face is a terrific idea, is unfortunately a never-ending ‘rabbit hole’ that will lock two currently antagonistic parties permanently together, causing endless litigation to spout as a result,” his filing states. The trustee’s attorney further urges the judge to simply approve a modified plan discussed at the last hearing that would have stricken any mention of the county from acquiring any easements on the golf course. However, one possible problem, and one addressed on Aug. 7, was the zoning issue involving a parcel on the golf course that will go to a third party creditor in the case, a money lender named Michael Zucaro who has a $537,500 claim against Caldera P&G. Also, Riegle during the last hearing made it plain that Nye County should be involved in the case. She also threatened all parties that none of them want her making the final decision, which could include simply liquidating all of the Willow Creek property and selling it all to the highest bidder. Kunzi told the court the county was prepared to purchase all of the golf course. Granier said such a move would just increase the likelihood of another health hazard developing with the golf course’s already troubled effluent ponds. 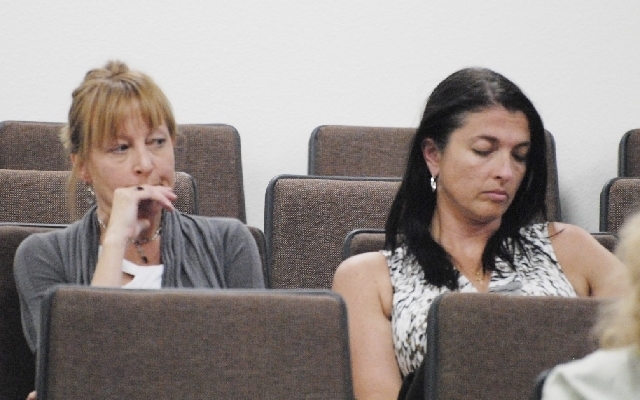 Wendy Barnett, UICN’s regional director, was on hand Tuesday awaiting the commissioners’ vote on the agreement — though now one is unlikely after today’s hearing in bankruptcy court. She said all UICN wants is to move on from the dispute and do something nice with the property. UICN will get 15 of 16 parcels of the 174-acre golf course.